I suppose Twitter will evolve and may become more sophisticated as more features are added. For example, Twitter recently added a couple of new features. One is Lists where you can define a global list (accessible by twitter.com//) and add to it anyone that you follow. For example, I have lists such as “enterprise”, “socialmedia” and “friends”. And twitter.com/farshidk/socialmedia is a public link that shows tweets from the people I have in my “socialmedia” list. You can easily configure a list to be private. The other new feature is Retweet where Twitter provides you with a single click retweet of a tweet that you are viewing. I don’t particularly like this feature because it is a single click operation that doesn’t allow you to edit the tweet or add anything to it. When I reteweet I often like to edit the tweet and use “via” to acknowledge the source. Compare this with setting up a complete account on Facebook or LinkedIn, where to have a complete profile one must provide a great deal of input data. Even in terms of feature set of Facebook once the account and profile is set up, there is a lot to learn. Furthermore, to properly and thoroughly be able to use Facebook, you need to use facebook.com. Though there are mobile clients for Facebook, they mostly provide limited functionality. On the web, when you want to use Facebook, you pretty much have to go to Facebook.com. What this means is that there is a proliferation of Twitter clients from providers other than Twitter itself that you can use to interface with Twitter. From thick clients such as TweetDeck to thin web-based clients such as HootSuite to mobile and smart phone clients such as Tweetie for iPhone and UberTwitter for BlackBerry, there are many options. You can also tweet via basic text/SMS to 40404; that is, post updates to the cell phone you have registered with a Twitter account. And if you don’t like any of these options and can program, you can always write your own Twitter client using the Twitter APIs. Any active Twitter user most likely has his or her own favorite ways of tweeting. In fact if you look at any tweet, it shows how it was sent, such as TweetDeck, web, and txt. Below I cover the two Twitter clients that I like and use often when I am online. TweetDeck is a thick Twitter client for tweeting with link shortening, viewing tweets from the people you follow (i.e. 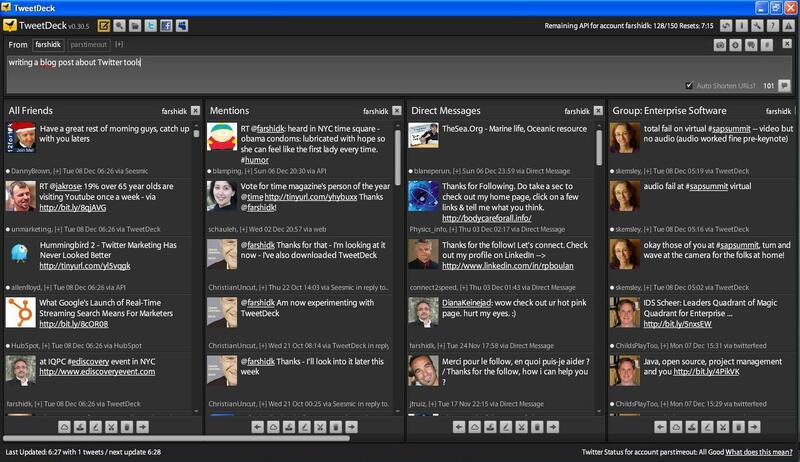 your timeline) as well as mentions and direct messages, defining and managing groups, and more. It provides support for multiple accounts so that you can manage several accounts from a single tool with a single login so you do not have to log in and out for different Twitter accounts. This is very important for people like me who have multiple Twitter accounts for various purposes. I have three accounts and without a tool such as TweetDeck that supports multiple accounts, it is not practical at all to tweet actively. Keep in mind that from twitter.com you can only work only with one twitter account at any time. TweetDeck recently broadened its scope and reach by adding support for Facebook and LinkedIn, so you can configure columns for Facebook and LinkedIn, receive updates from your friends and connections and post updates to those channels. Figure 1 below shows a typical TweetDeck configuration with simultaneous access to two Twitter accounts. The window scrolls horizontally so you can add columns for various purposes. For example I have columns showing tweets from people I follow, direct messages, and mentions, for each account. There are also columns for my groups. Or you may define a column for a particular search term. One can easily add and remove columns. One potential problem with TweetDeck is that it is not web based. What that means is that you cannot use it on a public computer. Also if you have multiple machines (e.g. a home laptop and a work computer) and have configured your TweetDeck clients with multiple accounts and columns) then you will have to do the same on every machine you use. Otherwise they will have different configurations. At the same time TweetDeck has interesting features that I like. For example, it runs on the background and pushes tweets with an optional chirping sound to a corner of your monitor with in a temporary pop-up. Some may find it annoying, but whether I am in front of my laptops or not, I usually have it running and almost take comfort in hearing the sound of tweets coming in. HootSuite provides Tabs that consists of columns. A tab represents a Twitter account, as well as Facebook or LinkedIn accounts. For example I have a tab for each of my three Twitter accounts as well as my Facebook and LinkedIn accounts. A tab may also be used for Groups, or as a Tracker. A tracker takes keywords including hashtags and monitors tweets with those terms. For example I have a Tracker with the search criteria “BPM or e-discovery”. If you configure Facebook on HootSuite, then you can view the posts from your friends, and you can post updates to your wall and status. The same holds true for LinkedIn. That is, if you configure LinkedIn on HootSuite then you will get status updates from the people you are linked with, and you can push updates to LinkedIn right from HootSuite. 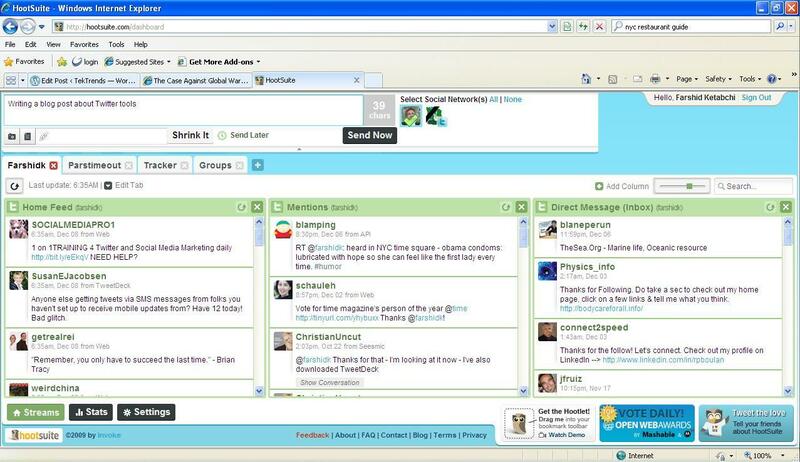 Figure 2 below shows a particular HootSuite configuration with two accounts, and four tabs. HootSuite also provides stats and reports for how often your tweets are viewed and clicked on. Another interesting and unique feature of HootSuite is that it allows you to schedule a tweet or post for a particular time in the future. If you know of other interesting Twitter clients, let me know. Thanks. This entry was posted in Social media and tagged facebook, linkedin, twitter. Bookmark the permalink.